Air Ministry Pamphlet 165. P/b, 15 x 19cm, 1st edition, January 1944, 20p. 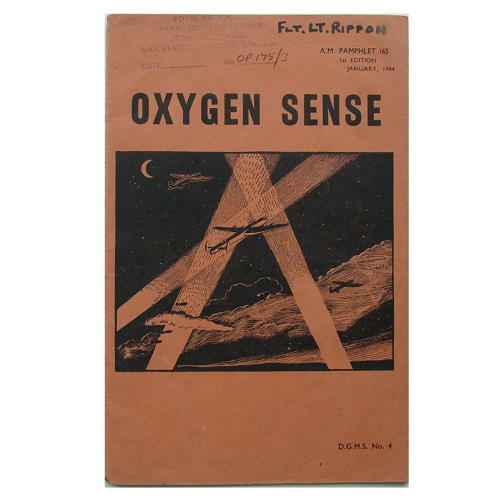 Provides information, hints and tips on the use of oxygen in flight. Illustrated with drawings and photographs. Covers the layout of an aircraft oxygen system and the oxygen economiser. Includes the use of the type G oxygen mask - fitting, size, the nose-wire, strap assembly, valves, oxygen tubing and freezing of the mask; the portable oxygen bottle; baling out at oxygen-requiring heights and the effects of lack of oxygen etc. The cover is named to a Fl. Lt. Rippon and overstamped 'Royal Air Force General Education Scheme, (Reference Books), RAF Station, Binbrook, Lincoln'. Shows use and wear but in good overall condition. Great little booklet. Stock code P21088.